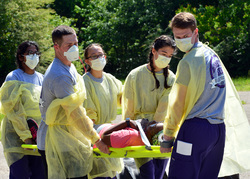 Senior students enrolled in Stephen F. Austin State University's DeWitt School of Nursing carry a patient to a treatment station during a disaster drill. The drills are organized by students and held each fall and spring semester. NACOGDOCHES, Texas - Senior students enrolled in Stephen F. Austin State University's DeWitt School of Nursing put the skills learned in the classroom to use during a recent disaster simulation drill, evaluating and treating 'patients' and transporting them to safety. The School of Nursing conducts the drills each fall and spring semester. Student leaders are elected by their classmates to organize the event. "It prepares us to really think on our feet," said Joshua Bliss, an SFA simulation team leader from Austin. "As nurses, we have to be prepared for everything." Participants acted as both nurses and patients during two different scenarios - an active shooter situation and a simulated bomb incident. For each drill, the nurses triaged patients, denoting the condition of their injuries before carrying them on backboards to treatment areas for medical attention. The Nacogdoches Fire Department assisted in both simulations, helping the nurses and acting as a hazmat team and law enforcement during the drill. Bliss and fellow team leader Shannon Morris of Cypress have been preparing for the drill since the beginning of the semester, working with student committees to plan, gather supplies and coordinate the simulations. The drill helps better equip the students to work in high-stress situations, Bliss said. "It's going to help us if a disaster actually happens because we will be able to put our skills as nurses to work," Bliss said. For more information about the SFA nursing program, visit www.sfasu.edu/nursing.